Navy Recovers Remains Of All 10 Missing Sailors Aboard USS John S. McCain : The Two-Way The sailors were killed in a collision between the Arleigh Burke-class guided missile destroyer and a commercial tanker last Monday local time in waters east of the Strait of Malacca and Singapore. The guided-missile destroyer USS John S. McCain moored pier side at Changi naval base in Singapore. The U.S. Navy's 7th Fleet announced Sunday that the remains of all 10 missing sailors from the USS John S. McCain have been recovered. The remains were recovered from the ship's flooded compartments by U.S. Navy and Marine Corps divers. The Navy has released the identities of the sailors. The Arleigh Burke-class guided missile destroyer collided with the Liberian-flagged commercial tanker Alnic MC before dawn local time last Monday, in waters east of the Strait of Malacca and Singapore. The incident is under investigation. The waterway is one of the world's most congested shipping lanes. 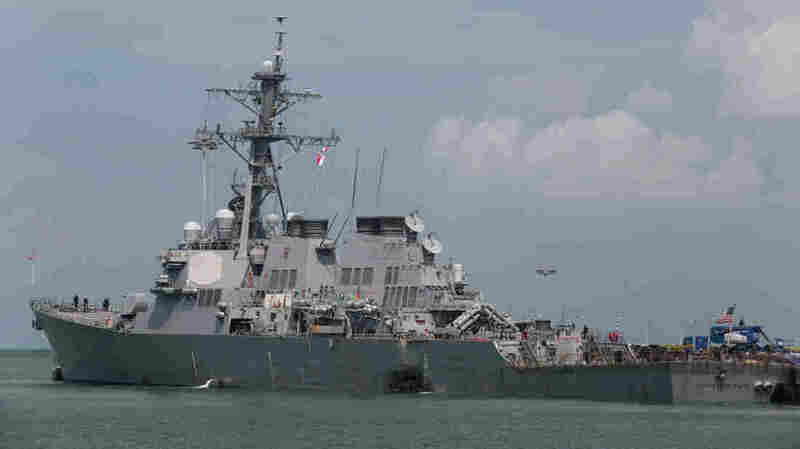 After the collision, the McCain proceeded to Singapore under its own power. This is the fourth mishap this year involving a U.S. Navy warship in the Far East. In June the USS Fitzgerald, another Arleigh Burke-class destroyer with the 7th Fleet, collided with a merchant vessel off the coast of Japan, killing seven sailors. In January the 7th Fleet's Ticonderoga-class guided missile cruiser USS Antietam ran aground near Yokosuka, Japan, where the fleet is based. In May another Ticonderoga-class guided missile cruiser, the 3rd Fleet's USS Lake Champlain, collided with a fishing boat in international waters off the Korean Peninsula. The commander of the 7th Fleet, Vice Adm. Joseph Aucoin, was relieved of command last Wednesday, only weeks before his scheduled retirement.